OG Elektra AS is a retail business enterprise founded by the Grossi family in 1991 with two local grocery stores. The company’s primary activity is food production and consumer goods import and sales. OG Elektra has been a family buiness from the start. The first stores were based in Lääne-Virumaa. 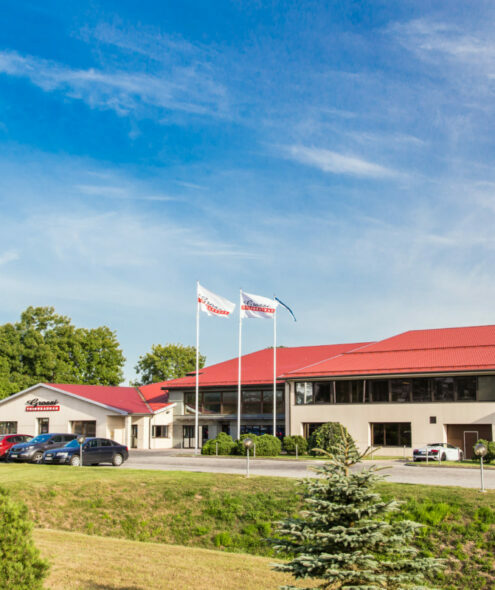 Since 2002, the stores have all gradually adopted the Grossi Toidukaubad trademark and have now expanded to different counties all over Estonia. The farthest store logistics-wise is Võru. Grossi Toidukaubad stores are located predominantly in residential areas or in their immediate vicinity, bringing everyday groceries comfortably close to every home. In total, the company has 60 food and consumer goods stores and 3 industrial goods stores all over Estonia as well as it’s own logistics center with a carpark, a central and a chilled warehouse in the Rakvere parish. The stores are divided by the size of the sale-room and the size of the assortment. There are a total of 5 categories – A+, A, B, C ja Y. A+ stores are the biggest and have the biggest assortments and C stores are the smallest. Y is used to mark industrial goods stores. The category of each store is indicated on the door of said store or found on the homepage. The main goal that is being worked towards can be summarised as follows – have the best prices and be a strong competitor in the field by having great quality products and homemade foods. Strength is added by the unique chain from manufacturer to customer that consists of pig farming, own production, the logistics center and the chain of stores. This chain ensures flexibility and stability and provides the opportunity to quickly adapt to the wishes of the consumer. The group of companies is strong thanks to the synergy that arises from working together. OG Elektra employes over 1600 people. Copyright © 2019 Grossi Toidukaubad. All Rights Reserved.